Since there aren't many feminine Blogger templates around, I decided to create a rather girly 3 column template based on the 897 template. Sorry guys, this one's for the female bloggers! I've also modified the template so that you can easily add elements to the header and main area in layouts, for example, to create your custom header design, or add a description to the top of your blog. To download, right click the link below and choose "save as". To upload to your Blogger blog, go to Template>Edit HTML and look for the section near the top which says "Upload a template from your hard drive". Browse for the template and click upload. Then you can view your blog to see the changes. 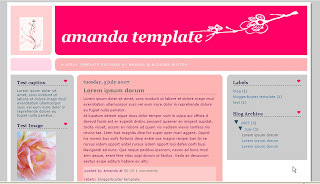 Download "Amanda 3 column template" here. If you use this template, I would be grateful if you would link back to Blogger Buster somewhere in your blog.